Can you believe Halloween is next week? The weather is turning (and creating problems - all of those affected by Hurricane Sandy are in our thoughts) and summer is now just a recent memory. Next week is a new month at Red Rubber Designs, too. Our First Thursday falls on the 1st of November and we have lots of fabulous stamps to help with your winter holiday preparations. Don't forget - you have several chances to win a Gift Certificate from the Red Rubber Designs store just by participating in our October Just Because challenge. 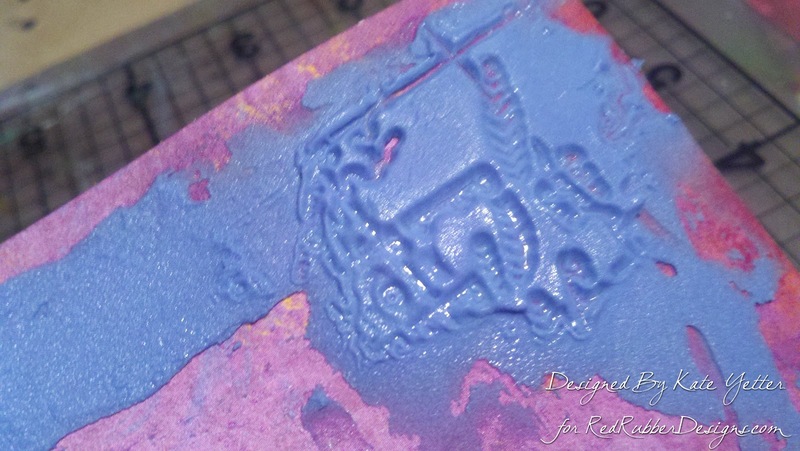 We'd love to see your work with our rubber stamps! Deadline is November 1st. 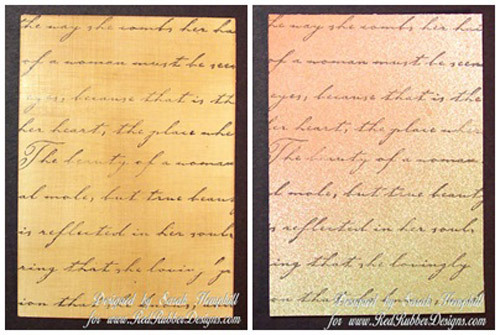 Also the Hope You Can Cling To event is still going strong over at SplitCoastStampers. Lots of prizes from the sponsors (we are also a proud sponsor of this event) are available for participants - plus you have until mid November to submit to the challenges. Check it out and spread the hope! We hope you have a delightfully spooky Halloween! See you next week! Today I am going to review 12 ways to make that white piece of cardstock more interesting. They are all basic techniques that can easily be done with products that you probably have in your stash. All samples have been done on ATC size blanks. On the left is a clean and simple style. 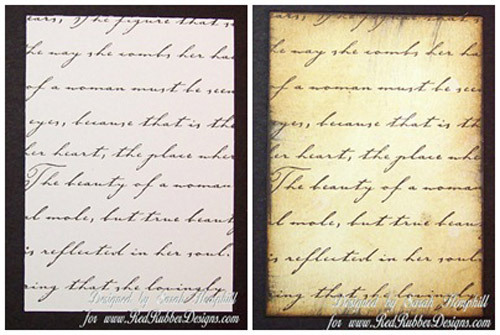 It is a script background stamped on plain white cardstock. 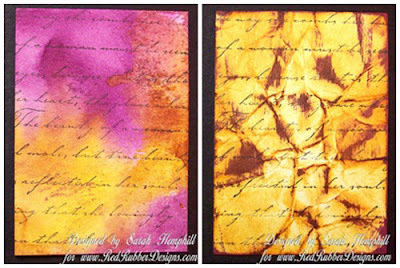 On the right a more vintage look achieved by adding distress inks. 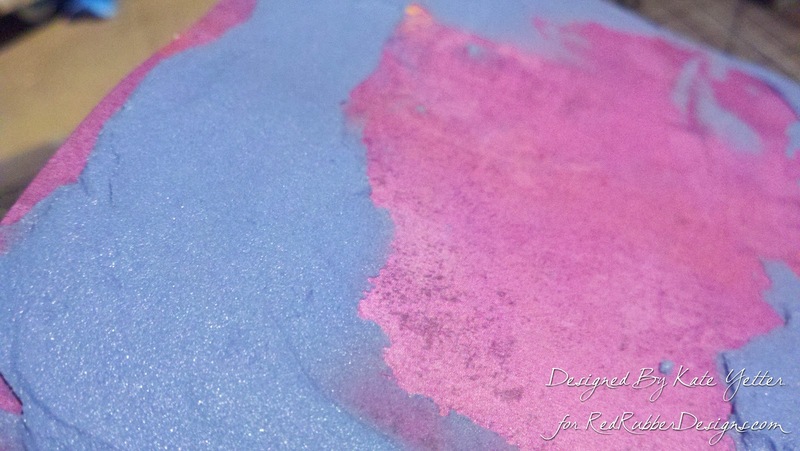 By adhering crinkled white tissue paper to your cardstock and then stamping with your background, you add a little texture. 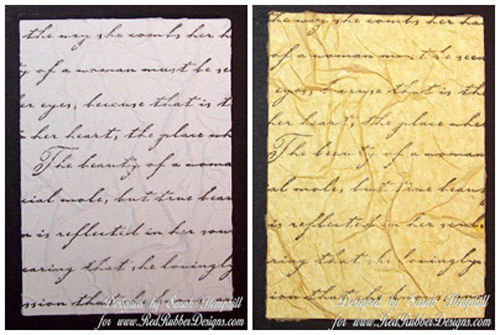 The sample on the right uses dressmakers tissue for a vintage look. 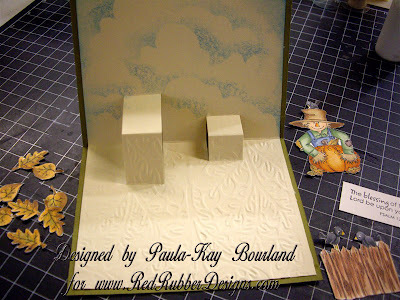 On the left is the faux linen technique. 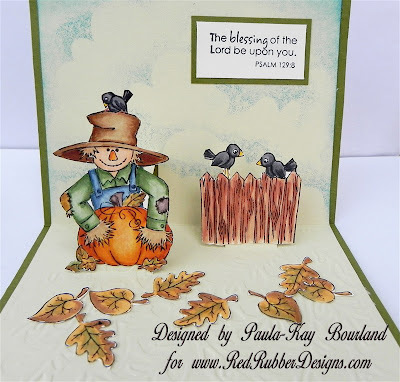 This look is achieved by taking glossy white cardstock, stamping your background image then sanding both horizontally and vertically then adding distress ink. 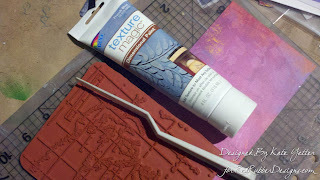 On the left a simple misting with two different colors of spray then stamping. 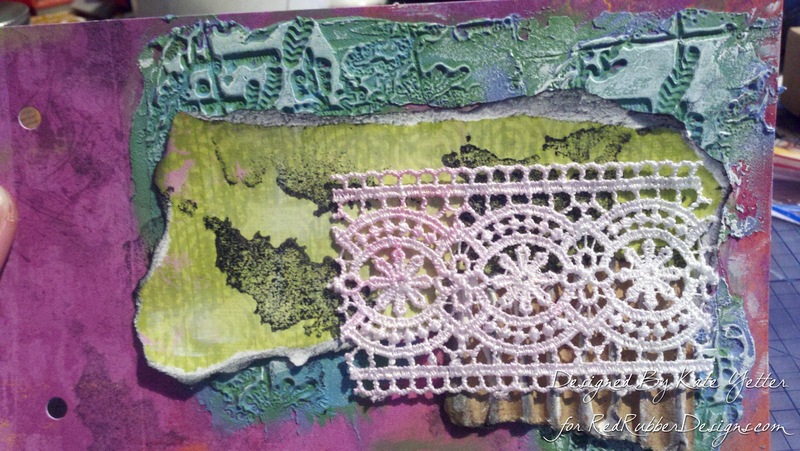 Another fun technique is the resist method. Stamp the script with embossing ink, add white embossing powder, heat emboss then add your choice of ink color with a blending tool. 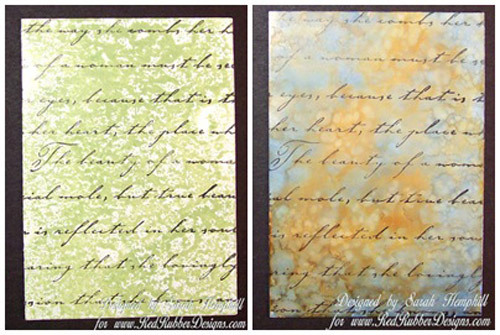 On the right I have stamped the script with embossing ink and then added chalks giving a soft pastel look. Both of these samples use the same colors of distress inks. On the left is the wrinkle free distress technique. This look can be achieved with your choice of colors. 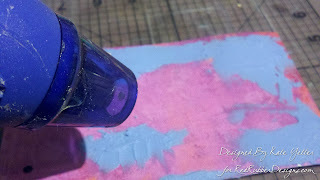 Simply apply Distress Ink directly from the pad to your non-stick craft sheet, spritz with water until the color beads. 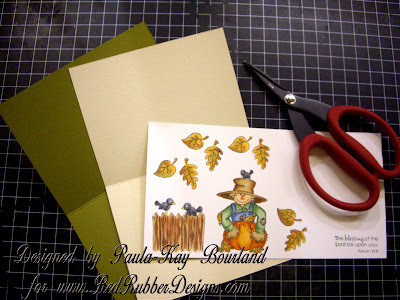 Drag paper through the ink, dry, repeat until satisfied, stamp with script. For the wrinkled distress technique, carefully crumple paper, flatten out, apply your choice of Distress Ink directly to the creases. Iron out the paper and apply another color of ink with a sponge or blending tool. On the left you see the fossil stone technique. Apply ink to two separate pieces of acetate, put the pieces ink to ink and squish. 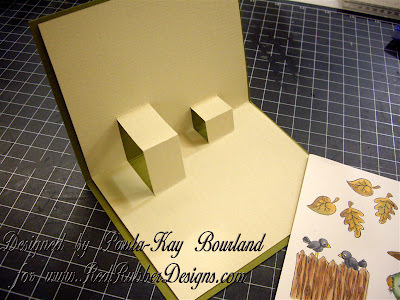 Pull apart and put 2 pieces of cardstock back to back between the two pieces of acetate, squish again. Open and pull off the cardstock from the acetate, dry and stamp. (A clear report folder works nicely for this technique). The sample on the right shows the results of playing with alcohol ink and blending solution. There are many more techniques out there for you to try and they come with different degrees of difficulty and some with a longer supply list. Hopefully this little review has sparked your creativity and will coerce you to pull out some of those long neglected supplies in your studio. 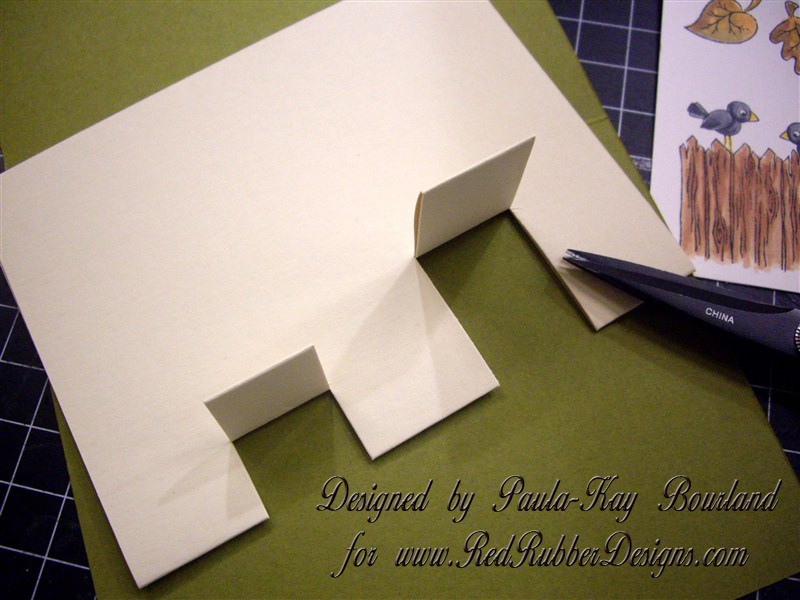 You can find this tutorial as a FREE PDF download in the Red Rubber Designs store! There is so much going on this month, I don't know where to start! 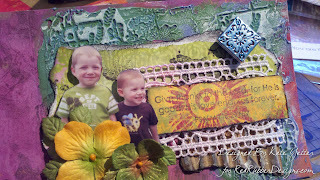 SplitCoastStampers' Hope You Can Cling To event is still in progress. 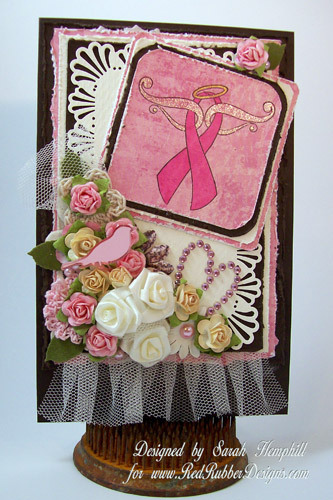 If you make cards, considering blessing the woman and their families faced with a breast cancer diagnosis with your handmade creations - and you can win prizes while doing it! Red Rubber Designs is one of the Pink Ribbon Sponsors for this event. 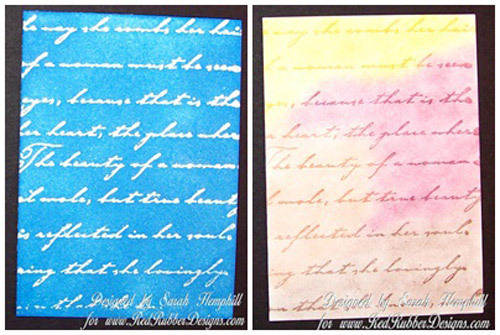 TWO Spotlight Stamps this month, both at 40% OFF their regular price! A PINK Big Deal - 40% OFF anything in the store that is PINK or has PINK on it somewhere (including the packaging)! Be sure to scroll through all of the goodies here, as you never know what you'll find at a fabulous price. This is in addition to the free gift I always tuck into your order! 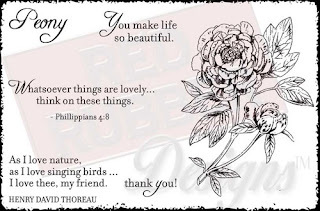 Our theme this month is Thankful & Grateful - and our Featured Stamps help you express those sentiments to those you care about. We have a special "Just Because" challenge this month - be sure to play along, because you can earn up to THREE entries to the random drawing for a Gift Certificate to the Red Rubber Designs store! 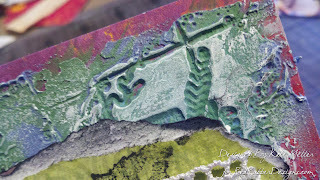 If you're not already a member, go sign up for RubberStampChat.net which is a fun place for rubber stampers to learn new techniques, share ideas and meet new friends. Registration is free. And the reason I'm urging you to become a member of their community? 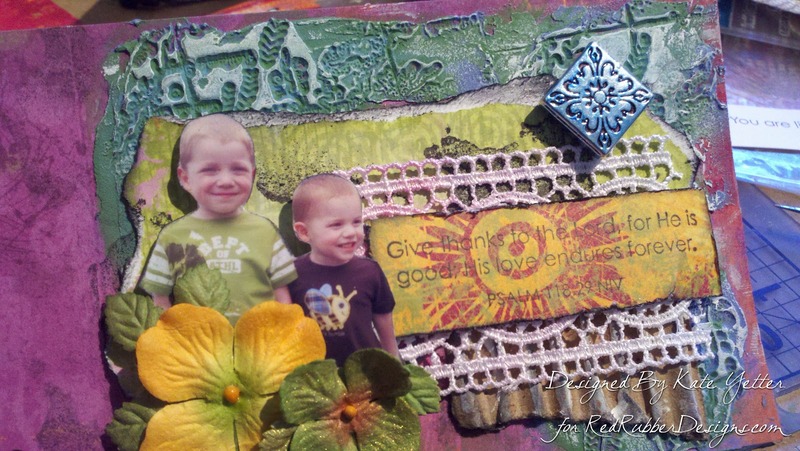 Besides socializing with other stampers and participating in the swaps they always have going on - they also host a Virtual Convention, usually every spring and fall. The next convention is this week - Thursday, October 25th through Monday, October 29th. 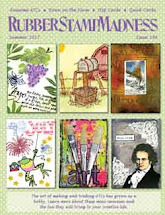 Red Rubber Designs is just one of the vendors participating in the convention and you are sure to find lots of good sales! For more information, check out this post: What is a Virtual Convention? Come join the fun! Okay, time for the new stamps that are now in the Red Rubber Designs store! A reminder for our international customers: We now ship our rubber stamps internationally! Please check our Shipping Information page for more details. That's all for now, folks - have a wonderful week! As the year moves into Autumn and the Harvest season, we all have cause to be grateful. This month at Red Rubber Designs, our new releases and our designs will focus on our thanks and gratitude. Also, this month we are a proud sponsor of the 3rd annual Hope You Can Cling To event at SplitCoastStampers! Each October, SCS partners with the UT MD Anderson Cancer Center for a month long card drive to benefit those affected by breast cancer. "Whether your stamps cling to acrylic, wood, or to your hard drive, they hold the power to convey hope and lift the spirits of anyone who sees what you create with them. That is the inspiration for our “Hope You Can Cling To” stamping campaign for Breast Cancer Awareness Month." Join us during the month for our own challenges and specials as we THINK PINK! 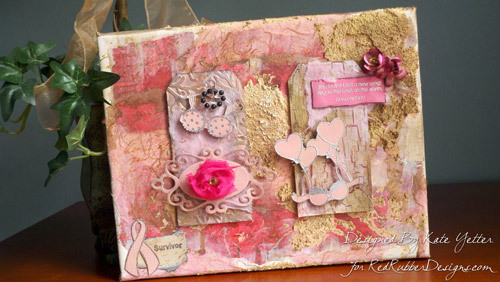 The beautiful Spotlight stamp set that our Design Team is featuring today is Lovely Peony. Spotlight Stamps are always 40% off with any order. What a great deal that is! Want to see all of the featured releases for October? You can find them here. With World Card Making Day coming up in a few days (Oct. 6th), the Design Team will be showing off their card making skills today. As an added touch, they will be decorating the envelopes, too. 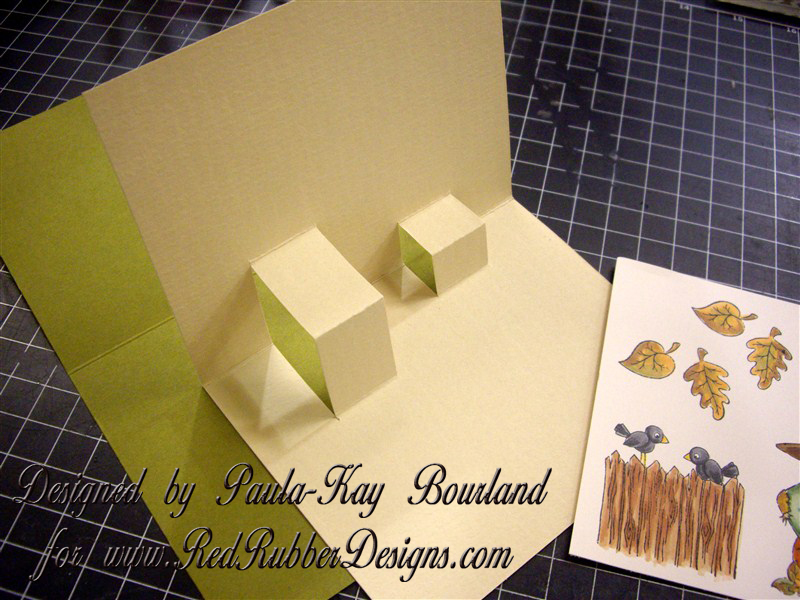 You might want to consider decorating your envelopes to make your presentation really special. It doesn't take much time to do but really adds a lot of visual impact. I guess you are wondering what the contest will be today. Okay...here it is. One lucky commenter will be chosen from the mystery blog to receive the spotlight stamp set (Lovely Peony). So to have the best chance of winning, be sure to comment on each Designer's blog. The winner will be chosen by random draw. Good luck and happy commenting! Contest ends on Sunday, Oct. 7 at midnight CDT. Welcome to our third Tutorial Tuesday Inspiration Challenge. For the last several months, our Design Team has been bringing you some wonderful tutorials to help with your stamping and crafting projects. Occasionally (usually about once a month) we have a Tuesday open and decided it was the perfect time to have a challenge and invite you to play. Our Inspiration Challenge is easy: It's an open challenge - you can create any project in any medium you like, as long as it's based on one (or more!) of our Tutorials. The only requirement is that you use a current stamped image from our store. You can find all of the Tuesday Tutorials here on the blog or you can download them free from our store. 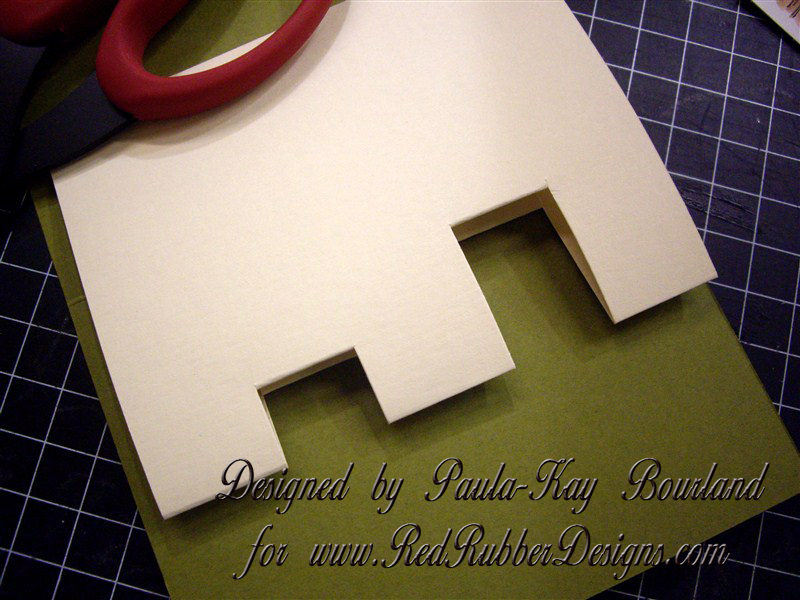 Please use at least one image from the Red Rubber Designs store as the focal point in your project. Upload your challenge submission to the Red Rubber Designs Flickr Group using the challenge tag TT1012 (that's TT [as in Tutorial Tuesday] 1zero12 [as in October "10" and the year "12"]). Also, please tell us which Tutorial you used as inspiration! See our Challenge Information page for details on the general challenge rules and how to upload your challenge submissions to our Flickr Group. Deadline for submitting is Tuesday, October 16, 2012 at Midnight CDT. A $10.00 gift certificate to the Red Rubber Designs store will be awarded ONE randomly chosen participant in our Tutorial Tuesday Inspiration challenge! Can't wait to see what our tutorials inspired you to create! 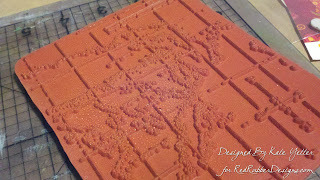 Red Rubber Designs is turning PINK! October is Breast Cancer Awareness Month and we're doing our part to Support the Girls. 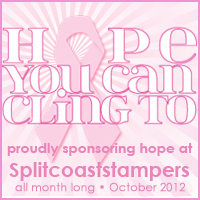 This month we are a proud sponsor the 3rd annual Hope You Can Cling To event at SplitCoastStampers! Each October, SCS partners with the UT MD Anderson Cancer Center for a month long card drive to benefit those affected by breast cancer. Don't miss our upcoming First Thursday as we kick off our new Featured Stamps and a new Big Deal. We'll offer lots of ways you can support those who have been affected by breast cancer, either directly or indirectly. 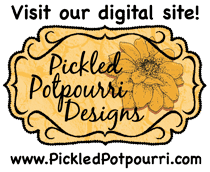 You can always see what new product is in the store, too - just click on the "New Arrivals" link at the top of the store page. At Red Rubber Designs, we ALWAYS have something on sale! And we have an easy "On Sale!" link at the top of the store page. Check back frequently, because this changes often! Have a good week and remember to THINK PINK!